It's the same book as the highly popular book released two years ago, but now in the euphonium/trombone/baritone range. Thanks for making this book for us Alessandro !!! 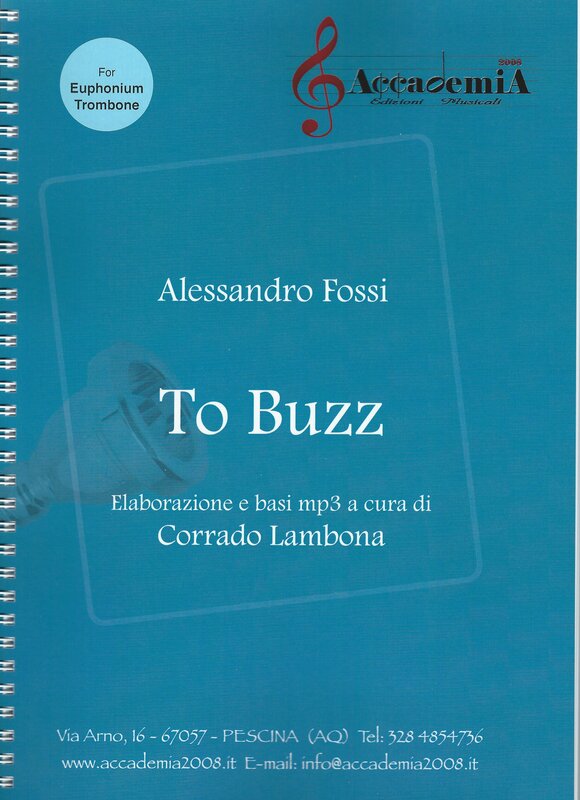 The 'To Buzz' book with accompanying CD was released at the ITEC2012 by the Italian tuba solo artist and teacher Alessandro Fossi. His presentation and demonstration of the method there brought widespread acclaim and most people who were in that seminar immediately bought this book afterwards! Although it is was originally designed for the tuba has been republished for euphonium and trombone players. This is the new updated version in bass clef. If you have never had a proper buzzing routine with your mouthpiece this will give you every single exercise you could possibly imagine. It is an extremely well put together a method with over 100 pages of examples and explanations, in English and Italian. The CD provided is a data CD and all the MP3 examples need to be extracted before you can play them through your MP3 player, or iTunes etc. I highly recommend this book and congratulate Alessandro on all the work that he has done in researching and putting together these outstanding exercises. To Buzz - The study of the mouthpiece is a practice recognized by the world's most authoritative exponents of brass playing; the benefits that can be obtained with a proper and systematic implementation are enormous.We can safely say that all noticeable problems on a technical level, starting from the production of sound, to legato and staccato, can be solved more effectively with the study of the mouthpiece before even dealing with the instrument. This is because we directly work at the source of the sound: the vibration.TIPS:Usually you use different mouthpieces for the bass tuba and the contrabass tuba (as for other instruments like the trumpet): they change the depth, the volume of the cup, the throat and the backbore, however the biggest difference between different mouthpieces is surely given by the inner rim diameter, since the vibrating surface of our lips will be different compared to inside the mouthpiece itself; so it is recommended (as with the instrument) to devote time to the study of different mouthpieces that we use regularly. To stimulate the vibration more efficiently, you will be able to perform studies in different ways:1 - only with the mouthpiece,2 - attaching a rubber tube about 10 centimetres (or more) in length to the throat of the mouthpiece,3 - using a spirometer to see if the vibration is supported by an adequate amount of air.Points 2 and 3 are the ones that I mainly recommend particularly when we perform a study in all keys.In this book you will find many exercises that require the use of glissando. This is because with this technique you can play an interval without changing the position of support of the mouthpiece on the lips; it is the muscles themselves rather than the movement of the jaw that will help us, particularly in the lower register, as, reacting to this stimulus, they will move flexibly to reach the desired pitch.The glissando will become a real workout for our lips, and that will allow us to develop our sound, as well as making us understand the correct setting for every single note (opening of the mouth, jaw position, angle of the mouthpiece) exactly and involuntarily.Initially, the main purpose of these exercises is to work on those frequencies where the sound stops, so that our lips are responsive producing a vibration at any pitch, especially when we’ll play an interval (small or large); with study these points will be reduced even more, and we will shift our attention to the homogeneity of our glissando. This will lead us to have a better command of our lips and the vibration coming from them.Remember while playing, that the most important thing is not the first or the last note of an interval but what it is in the middle, try to pay much attention to play the better glissando you can.Keep in mind also that this study will bring enormous benefits in the quality of your legato playing, as the glissando can to all intents and purposes be considered a legato in slow motion.Keep strictly to the rhythm when you play with the accompaniment on the CD: at the start of each track you will hear a metronome that keeps track of the tempo and a piano sound that will give you the pitch of the first note to play. Inhale steadily for two metronome clicks, trying to store as much air as possible, play the phrase and then breathe in the same way again. I usually tried to leave the 2 / 4 required for breathing between one musical phrase and another; if you find a longer break, such as 4 / 4, relax for the first 2 / 4 and inhale steadily for the remaining two.If you can not play all the tones of an exercise, especially the lower and higher pitched ones, do not worry. Get to where you can and try to get a bit further each day; do not expect to be able to do everything straight away or to be able to make giant steps; be consistent and rigorous in your study and learn to appreciate every small achievement.Always remember that our first objective must be the quality of what we do. Clearly, as I said, to get results we need consistency, only then can we see the benefits of this practice, these exercises should therefore be incorporated into our daily study plan, considering them as an integral part of our technique routine.You can start playing with the mouthpiece for about ten minutes (one of the longer exercises, or two or three or more of the shorter) before your practice routine.Once you are able to master all the etudes of this book you can continue adding more keys to each exercise both in the upper and lower register.I suggest you also use this method with the instrument, in this case, the exercises involving the use of glissando will be performed with the legato; you will have a full technical study plan, with which you can also exercise by playing with the basic accompaniment which will give you a reference for the rhythm and intonation.I wish you much success.